Eternal Flame at Memorial Park in Arlington Heights. Eternal Flame Dedication November 12, 2011 info. Veterans Day, formerly Armistice Day, is an annual federal holiday that is observed on November 11. Veterans Day coincides with other holidays such as Armistice Day or Remembrance Day, which are celebrated in other parts of the world and also mark the anniversary of the signing of the Armistice that ended World War I. 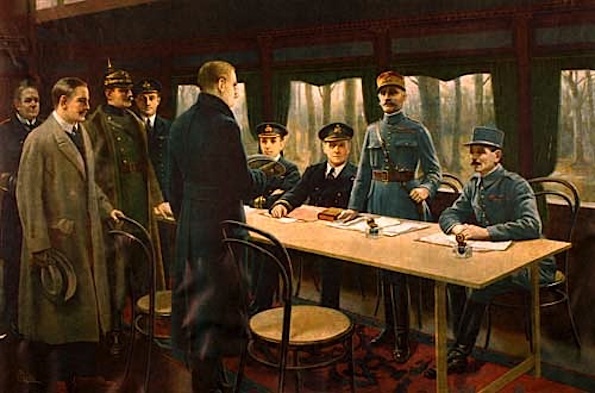 Major hostilities of World War I were formally ended at the 11th hour of the 11th day of the 11th month of 1918 with the German signing of the Armistice — signed in a railway carriage Compagnie Internationale des Wagons-Lits #2419 (“Le Wagon de l’Armistice”) in Compiègne Forest. The railroad carriage was seized from France by Germany in 1940 near the beginning of World War II, and torched and destroyed in Ohrdruf, Germany by German SS as U.S. forces entered the town. 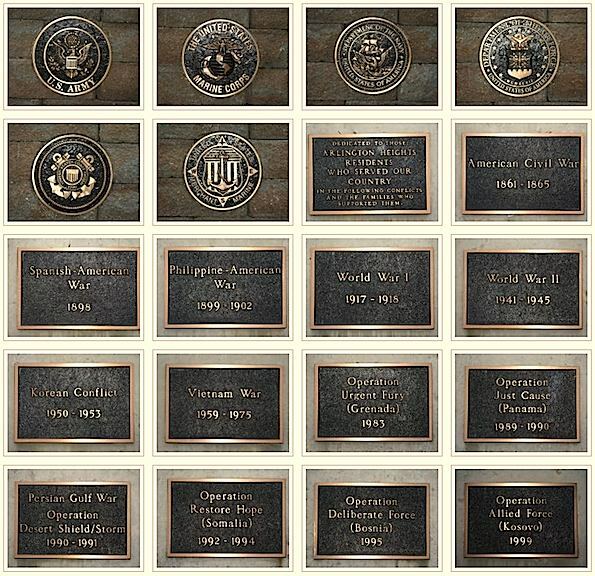 Memorial Park Plaques and Eternal Flame Facebook photo album (click). Painting depicting the signature of the armistice in the railway carriage. From left to right are German Admiral Ernst Vanselow, German Count Alfred von Oberndorff of the Foreign Ministry, German General Detlof von Winterfeldt (with helmet), British naval officer Captain Jack Marriott, and standing in front of the table, Matthias Erzberger, head of the German delegation. Behind the table are two British naval officers, Rear-Admiral George Hope, First Sea Lord Admiral Sir Rosslyn Wemyss, and the French representatives, Marshal Ferdinand Foch (standing), and General Maxime Weygand. USMC James Bray Stack Full Military Honors Burial at Memory Gardens Arlington Heights. USMC James Bray Stack was killed in action in Afghanistan on November 10, 2010.